Today I found out why barbecues are called that. 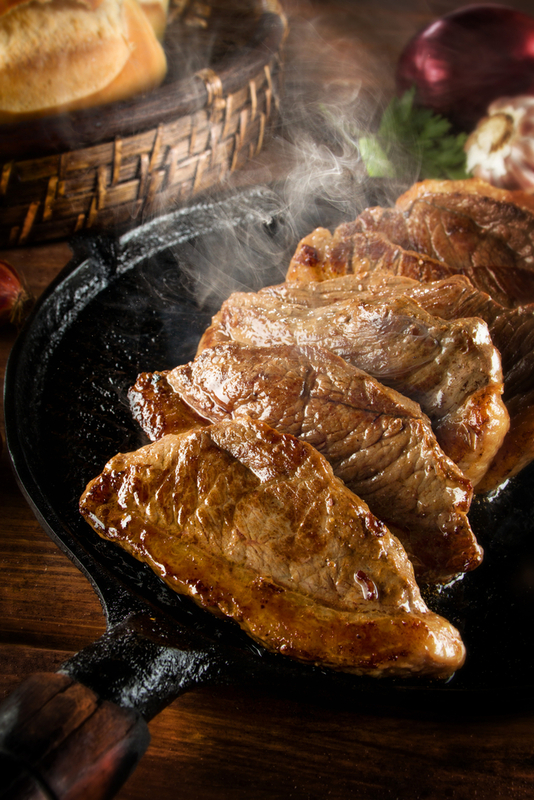 The word “barbecue” comes from the Caribbean word “barbacoa.” Originally, a barbacoa wasn’t a way of cooking food, but the name of a wooden structure used by Taino Indians to smoke their food. Due to the known diets of the Indians in question, it’s likely that the first barbecue consisted of some sort of fish, creatures from the sea obviously being plentiful in the Caribbean. Besides used for cooking, the structure of sticks could also be used as an area for sleeping, storage, and shelter. Spanish explorers took the word barbacoa back to Spain, where it appeared in print for the first time in 1526. For a while, barbacoa still referred to the structure that food was cooked in, but after a while people started using it to refer to the process of cooking food in a barbacoa and the cooked food itself. And lay there all night, upon our Borbecu’s, or frames of Sticks, raised about 3 foot from the Ground. to ba’rbecue. A term used in the West-Indies for dressing a hog whole; which, being split to the backbone, is laid flat upon a large gridiron, raised about two foot above a charcoal fire, with which it is surrounded. Today, there are just as many spellings for barbecue as there are meanings for the term. Many people use barbeque, BBQ, Bar-B-Que, and other variations thereof. That said, the “official” spelling is generally considered to be “barbecue” with a “c”, similar to the original. While people may debate over what should be the correct spelling or what exactly constitutes barbecue, there is one thing we can all agree on: a barbecue is definitely no longer a shelter or a sleeping structure! One fanciful etymology story about the word “barbecue” is that it comes from the French words for beard and tail, “barbe” and “queue.” Supposedly, the combination is meant to refer to roasting a pig, when you cook it from its top (beard) to its tail. While combining the words would give you something very similar to barbecue, it’s just not how the word came about. Another origin story is that barbecue is a contraction of the name of a popular US roadhouse that had pool tables: “Bar, Beer, and Cue.” There are no historical records to back this one up. Perhaps in an attempt to paint barbecues “as American as apple pie” (though apple pie isn’t really American), certain cookbooks from Texas have perpetuated the myth of a rancher named Bernard Quayle or Barnaby Quinn, depending on who you talk to. His favourite thing to do was cook up various types of meat over open pits and serve the food to his friends. On his ranch, his animals were branded with his initials—B.Q. Thus, his ranch became “Bar B.Q.” Sound a little farfetched to you? Yeah, us too. There’s about as much documented evidence backing this one up as there is that Mr. Rogers, who was in fact a pacifist and a Presbyterian minister, wore long sleeve sweaters to hide all the tattoos on his arms, one for each person he killed as a sniper in the military… Yep. For a while, early French explorers called barbecues “boucans,” which is where we get “buccaneer” from—they were the people who tended the boucans. While barbecuing meat is stereotypically portrayed as a “man’s job” these days, the first people tending the barbecue were probably women. The family structure of the tribes using the barbacoa usually meant that the men were the hunters while the women were the cooks. President George Washington himself was a big fan of barbecues. He wrote in his diary about going to a barbecue in 1769 (“Went in to Alexandria to a Barbecue and stayed all Night.”) and hosting one in 1773 (“a Barbicue of my own giving at Accatinck”). He is even thought to have taken 48 bottles of French claret to one. Sounds like a recipe for a good time. Barbecue competitions have been taking place since at least 1959. The first one seems to have taken place in Hawaii just a few months after it became a state, and was only for men. Twenty-five men entered the cook-off, competing for the grand prize of $10,000 (about $77,600 today). More recently, “Barbecue Pitmasters” aired on TLC, featuring people cooking up their best barbecue recipes to compete for a $100,000 grand prize. Ah, barbecues. I just love them. Living on a houseboat with an amazing view from the top deck meant many meals were eaten straight from the barbecue. I always think it’s the best kind of food. It’s a fantastically social event too because everyone brings something to the barbecue, and I love this way of contribution! Plus, there’s always shed loads of leftovers meaning barbecue for dinner for several days afterwards! Hum, barbarian; a member of a community or tribe not belonging to one of the great civilizations (Greek, Roman, Christian). Shockingly, not all words are of European origin. Man I love steak so much…. What a BS article “Originally, a barbacoa wasn’t a way of cooking food, but the name of a wooden structure used by Taino Indians to smoke their food” ? It’s a wooden structure used to place the meat on and it’s an open flame same as what Americans called grilling with coals. Only reason it’s built off the ground to that height was because they cooking for plenty and would be a huge flame. Has nothing to do with at a height so that it’s only smoke. Makes no sense . Let me see you try and recreate that and tel me if the winds don’t blow away your smoke. In the Caribbean American bbq is called smoked bbq because you put it in an “oven” and let the smoke from wood flavor your meat. Wrong. It’s a French term. Beard to tail. Look up the translation.